Perhaps one of the most frightening cards in a love Tarot reading is the Devil Tarot card. The image of the Devil invokes fear, uncertainty and trepidation. However, in most love Tarot readings, the Devil Tarot card is often misunderstood. The Devil Tarot card should not be interpreted literally. In truth, it is a metaphor for our own behaviors and attachments to other people. In love Tarot readings, the Devil serves as a messenger. Its appearance warrants reflection and a willingness to explore our own behaviors in relation to others. Traditionally, the Tarot card meanings of the Devil Tarot Card refer to issues of materialism and self-centeredness. It is a warning that one may be misusing their power or influence. It also refers to self-indulgence and the insatiable need to gratify one’s most primitive desires. The Devil is the Tarot card that requires one to go within their shadow self and become conscious of their darker impulses. Ultimately, one must confront these impulses and learn to master them. The Devil reminds us, that if we are not conscious of our own behaviors, we will be enslaved by them. In love Tarot readings, the Devil Tarot card often refers to one’s emotional dependency on their romantic relationship. 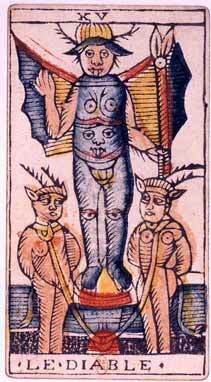 In essence, the Devil Tarot card is the card of co-dependency. When one becomes completely dependent on their partner, they lose their personal freedom. This type of freedom comes in the form of an inner independence: a person does not need to be attached to another person in order to feel whole and fulfilled. In love Tarot, the Devil can suggest that one’s attachments may be too dependent on another. The Devil reminds one that they have their own inner power and ability to take care of them selves, regardless if they are in a relationship or not. Another suggestion of the Devil Tarot card in love Tarot readings is its reference to one’s painful past relationships. In this case, there typically is an unhealthy attachment or negative projection into one’s current relationship. The Devil Tarot card is a reminder that one has become enslaved by one’s past and that their current romantic relationship may be influenced by old wounds that have not been emotionally processed. The Devil urges you to explore the nature of your current relationship. This is the time to ask yourself if your current relationship is healthy? Are you being enslaved by it? Are you repeating past behaviors? Is your relationship being driven by early childhood needs that were never appropriately met? Are you choosing to stay in an unhealthy relationship because you are trying to heal an old wound? In love Tarot, the Devil Tarot card urges one to become conscious. It is a card that warrants attention and reflection. The Devil requires us to look within and explore our own impulses and needs. Are we enslaved by them? If so, how might we free ourselves? When it comes to romantic relationships, the Devil reminds us that we have the power to choose the type of relationships we want. He reminds us that we must be willing to face our fears and past hurts in order to find personal freedom and wholeness.